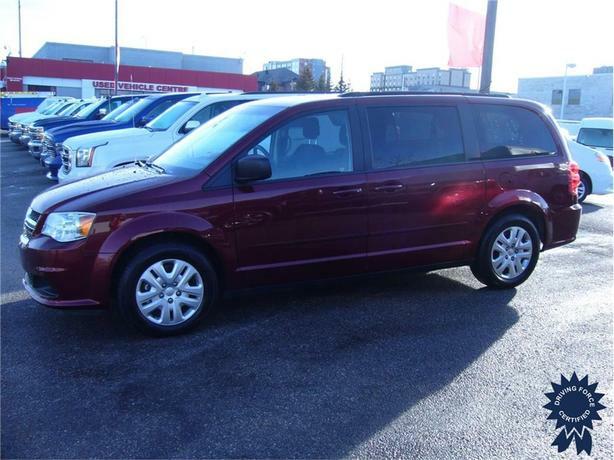 This 2017 Dodge Grand Caravan SXT 7 Passenger Front Wheel Drive Minivan comes with a 6-speed automatic transmission, 17-inch wheels, octane red exterior color, touring suspension, light greystone/black cloth bucket seats, Single DVD Entertainment Group Package (factory DVD package with wireless headsets), SiriusXM satellite capable radio, stow and go seats, backup camera, Bluetooth hands-free calling, deep rear storage area with bag holders, 4-way manual driver seat and front passenger seat with manual recline and fore/aft movement, steering wheel audio controls, electronic stability control, rear heat and air-conditioning, power door locks with autolock feature, three 12V DC power outlets, low tire pressure warning system, LED brakelights, balance of Dodge warranty, 2 sets of keys, clean CarFax vehicle history report, all books and manuals from new, certified to our high standards, and GWVR rating of 6,050 lbs (2,744 kgs). The award winning 3.6-litre Pentastar V6 gas engine provides 283 horsepower at 6,400 RPM and 260 lb-ft of torque at 4,400 RPM. Touch base with us to discuss purchasing or financing options that are right for you and experience the difference you will only find at DRIVING FORCE Vehicle Rentals, Sales and Leasing.